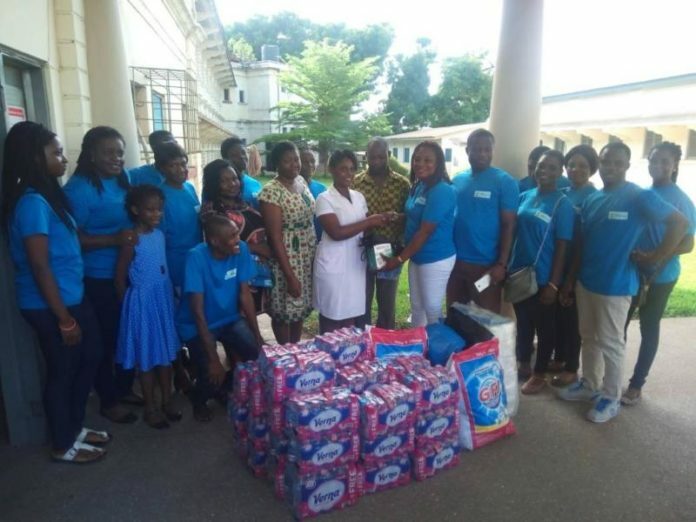 Dzimega Prostate Foundation, a non-profit charity organization, which aims to create prostate cancer awareness has donated assorted items to patients of the Korle-Bu Hospital Prostate ward. It also gave a Blood Pressure Monitor and a thermometer to the Ward. The items included 31 packs of washing powder, boxes of mineral water, 60 packs of T-roll, detergents, washing and bath soap and 30 packs of Pepsodent toothpaste. Ms Doris Dzimega, the Founder of the Organisation, presenting the items, said she decided to establish the organisation, after the family lost their father to the Prostate Cancer disease. “The donation is to mark my late father’s 12 years anniversary,” she said. She said after the death of her father, she decided to research into the disease to help her to be enlightened about the exact cause of death of her father, and this had resulted in the formation of the organisation to support patients, who suffered from the disease. She said as part of their activities, they promote early detection and provided support for those affected and they collaborated with organisations that shared the same goals of Prostate prevention. Ms Dzimega said the organisation also encouraged screening for early detection to improve effectiveness in the treatment of the disease. “We also provide financial support for patients through fundraising for treatment at the early stage and for recovery,” she added. The Founder said management of the Organisation envisaged to achieve a near zero Prostate Cancer cases in Ghana in the next five to 10 years. She said they would also undertake seminars and symposia, counselling programmes and other things to support their operations. Ms Christabel Thompson, a Principal Nursing Officer, who received the items expressed gratitude to the management of the Foundation for their support, and called on other organisations to support in that regard. She said Prostate Cancer was among the top ranked disease among the aged men in the world and called on men, especially the young ones to seek early screening. She said they should check their Prostate status once a year, because the disease was on the increase in Ghana and a majority of men were not aware of the disease. Mr Francis Atta Larbi, a Principal Nursing Officer, told the GNA that there had not been effective awareness creation on the disease except for some few individuals, who run their own campaigns. He, therefore, called on stakeholders to support in providing a massive awareness creation among men in the country.